Which international domain to choose? Home Insights Which international domain to choose? Choosing the most suitable domain for your overseas expansion is a vital first step on the path to international success online. 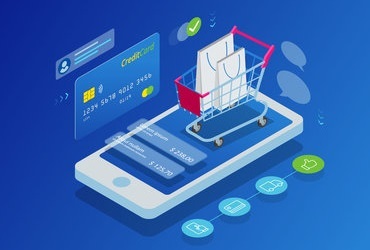 However, many struggle with this decision and find understanding the subtle differences and the impact a domain has on business processes confusing. Search Laboratory conducted a European survey which found that 87% of businesses believe it’s important to have a local website domain, such as .fr or .de. This reflects the fact that if you are expanding to an overseas market, businesses are generally more successful with a country-coded top-level domain (ccTLD). By using the ccTLD you’re not only ensuring that your website is most suitable for the search engines, but also establishing trust with the user: someone looking to purchase from you feels greater trust in a brand that is well established in their market. Signalling this through a ccTLD compared to a generic .com site is common practice and is an important signal to customers to display when expanding overseas. Building authority from the ground-up or using your domestic site’s existing authority. With a ccTLD the domain authority for each site would be self-contained and not shared across the sites. If using a sub-folder, each subfolder would benefit from the link authority possessed by the top-level domain, especially if internal linking was used efficiently. But with a sub-domain the site will struggle to benefit from authority held by the main site. What trust signals does the market you are expanding into require, and how can you match the majority, or ultimately all, of these requirements? A native user in each market is likely to place the highest degree of trust in a ccTLD that is specific to their country or region. 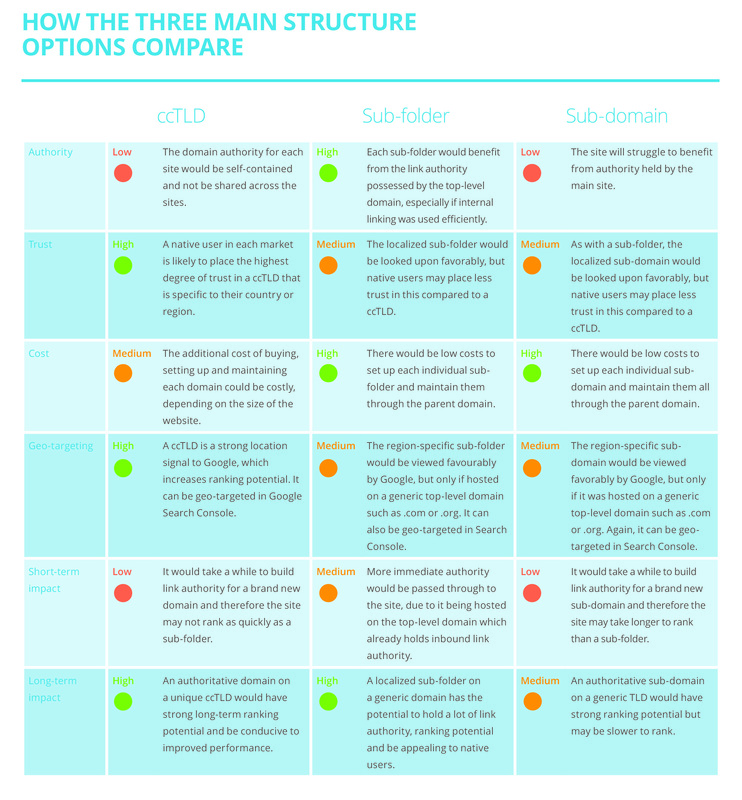 A localized subfolder or sub-domain would be looked upon favourably, but the native users may place less trust in these compared to a ccTLD. With a ccTLD, the additional cost of buying, setting up and maintaining each domain could be costly, depending on the size of the website. Whereas there would be a lower cost to set up each individual sub-folder or sub-domain and maintain them through the parent domain. The strength of the signal passed to search engines as to which region your content is targeting. Even top-level segmentation (such as sub-folder or sub-domain) is recommended over no segmentation at all. A ccTLD is a strong location signal to Google which increases ranking potential and it can be geo-targeted in Google’s Search Console. The region specific sub-folder or sub-domain would be viewed favourably by Google, but only if hosted on a generic top-level domain such as .com or .org, they can also be geo -targeted in Search Console. Does the choice of domain have an instant impact? Does this impact last in the market? And does this match what you wish to achieve in the market? 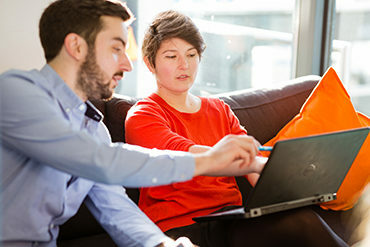 It would take a while to build link authority for a brand new domain (ccTLD) and therefore the site may not rank as quickly as a sub-folder where more immediate authority would be passed through to the site, due to it being hosted on the top-level domain which already holds inbound link authority. It would take a while to build link authority for a brand new sub-domain and therefore the site may take longer to rank than a sub-folder. Is the choice of domain better suited for a longer campaign in the market? Is long-term part of your business plan? An authoritative domain on a unique ccTLD would have strong long-term ranking potential and be conducive to improved performance. A localized sub-folder on a generic domain has the potential to hold a lot of link authority, ranking potential and be appealing to native users and an authoritative sub-domain on a generic TLD would have strong ranking potential and lead to improved performance. Ultimately, it’s down to each website and the business’ individual needs. 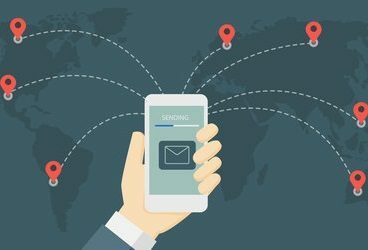 If a company wants their various country sites to rank as quickly as possible, for example, then implementing a sub-folder structure would be immediately beneficial. However, if long-term consumer trust and geo-targeting are more important to a business, then a ccTLD might be the most appealing choice. Assess each option carefully before deciding. If you need more tailored advice on taking your website into new overseas markets, please feel free to get in touch on (347) 763-6933.